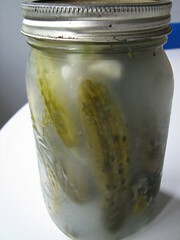 KimmyKokonut » Blog Archive » Pickles: Sour dills! You would think with my Polish heritage I would have secret family recipes but I don’t. So I turn to good ole’ Sandor and his amazing fermentation bible for advice and encouragement which never fails. 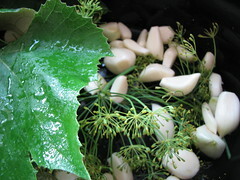 I made his sour dill recipe with a bunch of cucumbers I bought at a farm stand (my cucumber crop was a failure this year! it was in too shady a spot. and I think it would help if I watered it more often). So I followed his recipe and fermented it in the crock that is my slow-cooker, which was the perfect size for a plate to fit on and weigh down the cukes. We are blessed with a gigantic grape vine so I had easy access to grape leaves, which magically retain the crunch on pickles. Oak leaves also do the same thing. Since it was still summer when I fermented them, they were ready in less than a week. These pickles are unbelievable. They are unlike any store-bought pickle I have ever had. They just taste…right. I love how there is no vinegar added, just a salt water brine and some dill and garlic and it’s heaven. I ended up with about 4 mason jars’ worth and have eaten my way through half of them. I must confess I am a bit of a food hoarder so the last jar may hide out in the fridge for a special occasion (or until next cucumber season–but I doubt that). I just found chanterelles from last year in my freezer and realized I should enjoy them since fresh ones are now in season. I just can’t bring myself to have the last bite of food or eat the last bit of something—just in case of who knows what…but it’s definitely programmed into my head. The best bonus of these pickles is that there is a giant pile of brined garlic waiting to be eaten along with the pickles. Crunchy with a pungent spicy garlic bite, each clove is an adventure to eat. It’s so delicious and I just assumed it was pickle by-product bound for the compost. But no, this garlic is great. I haven’t used it for anything in the kitchen except for eating out of the jar. I bet it would be great sliced on put on a sausage-dog with some sauerkraut. Now that’s an immune system boost I could eat every day. I love dill pickles. Yours sound marvelous! I must start doing more creative food preserving. I only ever freeze or jam fruit. It is nearly impossible to find non-sweet pickles here. People just don’t know what they are missing. Yummy. If you can access cucumbers you can easily ferment them. All you need are cukes, salt and water. (Garlic and dill help but are not necessary).